Fully upright is the best position for cycling. Don’t let anyone convince you otherwise. They’re only trying to sell you a bike that’s less comfortable in exchange for maybe a tiny percentage of gain in leg-effort or some other power dynamic that you won’t ever consider while you’re actually riding a bike. No, I wouldn’t want to tour fully loaded on an upright. Other riding positions have their usefulness, but nothing beats upright for every day cycling. 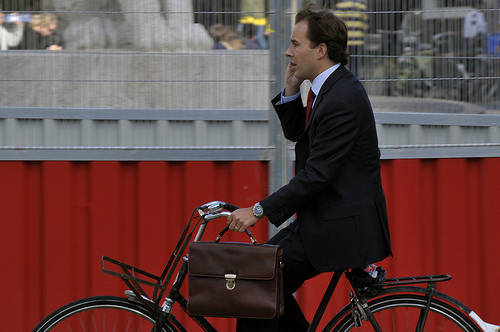 I find myself wishing for a taller stem on my Raleigh to make it more like my bakfiets and here is one reason why: when I wear a suit on a bike I want it to fit like it does when I’m standing or sitting at a desk. When I ride in even the most moderately “aggressive” position, my clothes lay taut against my back instead of hanging on the frame of my body. That means my shirt is clinging to my sweat when I want it to be moving loosely around me like it would if I were off the bike. Or riding upright. *Finding a fully upright Dutch-style bike in this country is not an easy thing, I know. Even the big name hybrids out there lately are closer to the positioning of my Raleigh 3-speed than to a Dutch bike. Hmmmm hyperbole? I fully agree that Dutch-upright is supremely comfortable and woefully unavailable to most would-be daily riders on this continent. But I find that climbing even modest grades with a fully upright posture is, well, a significant compromise. Could be hyperbole! I think I’ve just gotten so accustomed to it between my 3-speed and the bakfiets that I’ve reset my expectation for what a hill climb should feel like. And I’m so rarely on my road bike these days that I don’t have much left in my muscle memory for comparison. So I should qualify: ride upright long enough and you won’t miss the extra power you could have otherwise because you’ll be too busy enjoying the view. Does that work? Honestly unless there’s something gone very wrong with their distribution, Specialized’s Globe brand of work and utility bikes should be available all over the US. After all, the company’s American, for goodness sake! They have plenty of bikes that would fulfill the role you’re describing.